In this first major period they are called the Basketmaker Anasazi because of their highly refined basket making. 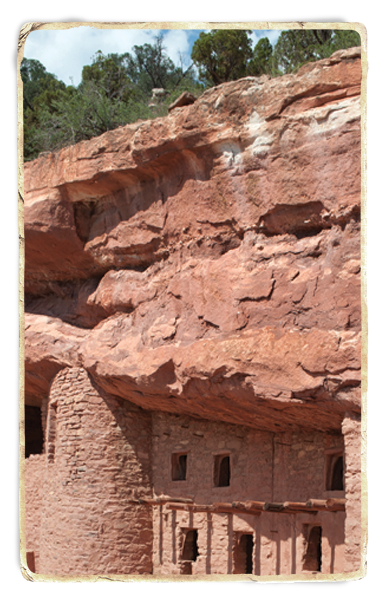 Today, we say the Anasazi emerged as a distinct culture as early as 1200 B.C., when they began to depend more on growing domesticated crops and began to make their houses more permanent. We call their early homes pithouses. The house was nothing more than a shallow hole in the ground which was covered with a roof of branches and mud. They still moved around as they depleted soil and exhausted wood supplies and game animals in an area. In this first major period they are called the Basketmaker Anasazi because of their highly refined basket making. They used yucca, apocynum, bark and other plant fiber to make things like sandals and baskets to store food. The baskets were light and portable and suited their lifestyle. They also began to weave and make cord, then clothing, from cotton. During this period they also began to make pottery, often forming coils of clay inside a basket for structure, then scraping and smoothing the surface with a stone. Pottery was clearly superior to baskets for holding liquids and cooking food.